Conservation – What does it mean? 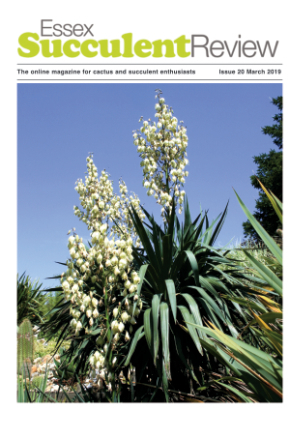 The Essex Succulent Review is a quarterly publication available to download in pdf format. This month our cover picture shows Yucca gloriosa recurvifolia in full bloom in Melissa and Keith Scott's magnificent exotic garden. See many more beautiful pictures in the article featured in this issue. Quicklinks is a new feature on the Essex Succulent Review website to help you find items in the ESR which form a series of related articles, some of which are still on-going. The longest of these was the 'Gardening with Succulents' series by Paul Spracklin in six parts during 2015 and 2016, but also included are Bob Potter's on-going articles on 'Interesting Euphorbias', Chris Coombes' 'Succulent Oddities' and the two-part article by Nick Gash on 'Adenia'. Click on the Quicklinks link in the main menu, choose an option, and you will be taken to a page from which you can download all the issues containing an article in that particular series. Finally if you have enjoyed an issue of the Essex Succulent Review why not subscribe. Details below. As soon as each issue is available, you will receive a notification by email, with a download link. Please note the pictures and articles included in the Essex Succulent Review are copyright and may not be reproduced without permission.